CHIVE TALKIN’. 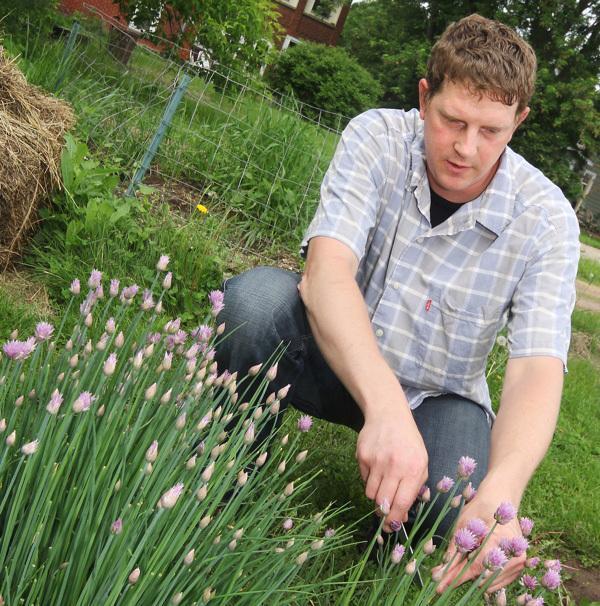 Chef Nathan Berg cuts some fresh chives in his garden. Berg is seeking funding for his newest venture, Four Chairs, a restaurant serving meals only to groups of four at a time. To put it simply, Nathan Berg is the kind of chef you need in a thriving community because he is simultaneously innovative and locally focused. Berg is the former proprietor of Native Bay restaurant outside Chippewa Falls, a place where the cuisine was both immaculately presented and locally sourced. It was the super club for those of us who appreciate ethical cuisine. Blending local sourcing and fine dining comes at an obvious cost, he acknowledges. “I’d like to think that, on some level, the problem is not actually getting people interested in local foods, but getting people used to the idea that restaurants which serve local food are going to have to charge a little bit more than the other places,” Berg says. “Certainly, my culinary experience is in fine dining and that brings its own higher prices, so I’m fighting a double battle in that regard. In Berg’s opinion things are improving in the Chippewa Valley food community despite the tough economic times we’ve gone through in the last few years. Four Chairs is Berg’s next innovation in the dining experience. The concept behind the restaurant, which Berg hopes to open in Chippewa Falls, is simple: It will serve a six-course meal to only four diners at a time (thus the name). Berg says that this idea came to him in a dream several years ago, and he searched in vain for such a restaurant in the real world. “I’ve never found anything exactly like it, at least not here in the U.S.,” he says. “Mostly, I think that there aren’t very many talented chefs who are willing to sit around and take on all of the cooking, serve the customers and do all the dishes night-in, night-out, which I am. If that isn’t enough to whet your appetite there will be a launch party on June 23,where the epicurious can make donations and try a whole slew of food with all proceeds going to making Four Chairs a reality. Four Chairs Launch Party • noon, Sunday, June 23• Tomahawk Room, 306 N. Bridge St., Chippewa Falls • donations accepted • 715-726-9433 • search for “Four Chairs” on Facebook.com.